"Well it´s first time for everything", might as well start the shows with "Bentley" Brookway Academy Choice and of we went to Sweden, to "Skokloster Summer Show´s" in Tammsvik. Maily to see all those wonderful dogs that we usually admire only from websites. Love summer house at the islands, would yo like;)? Also at Swedish Whippet Club´s National Speciality Bentley was 2nd best baby with Honours Prize and great review, from judge Bo Bengtson (Bohem)! "If you run and I stay here...?" 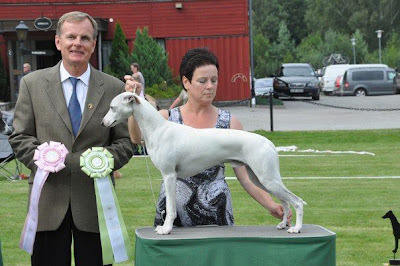 "Noah´s" Ch Spellbound Forgetmenot Santana son "Milton" Bona Diva Oriental Pearl did wonderful too, BOS Puppy at Swedish Whippet Club´s National Speciality, judge Bo Bengtson! Lovely old house we stayd, one counted 18 people and 22? dogs, all Finnish whippet people, had a great time! Always time to kids play! Thank you all, had a great time!! !